The Happy Planner by Me And My Big Ideas (MAMBI) has quickly been taking the planning community by storm with its affordable but highly customizable planner options. In fact, I actually swept one up a few months back and put it into my spiral bound, but I ended up falling out of love with my a5 binder soon after and sold the Happy Planner inserts along with it. When the release of the new Happy Planners arrived, I decided to give it a go... but with a twist. I used a 50% off coupon at my Michaels and bought a Happy Planner for only 15$, which is AMAZING, considering an Erin Condren can go for 50$! I knew I didn't want to my Happy Planner up and put it in an a5 binder again... but I did want to use another system of binding. I know quite a few people love the disc bound system the planner originally comes with, but it would not work for me and how I handle my planner. I needed something that will keep my planner intact when I take it to school or travel, without the fear of my pages coming undone on the way. That is when I started to do some research on getting my Happy Planner bound in a shop. I gave my local Fedex a call and they told me they were able to bind it for me for under 5$! Can you believe that? That would make a spiral bound Happy Planner only 20$! Needless to say, I took my planner into my Fedex and it was ready within a few hours and couldn't be happier. The only thing I would change, would probably be the color of the coil, which I am not particularly fond of. With a can of spray paint, I could easily change the color of the coil to virtually anything I wanted, and I love that! In the picture shown above, I have 3 different views of how the original holes look with the spiral coil. It is hardly noticeable and does not interfere at all with the planner itself. That means that the weekly boxes and monthly days are completely untouched! Yay! The imagine above is to get an even better idea of how the weekly spread looks with the spiral bound. I am madly in love and cannot wait to start using my Happy Planner! If you decide to spiral bound your planner I would love if you tagged me on social media! 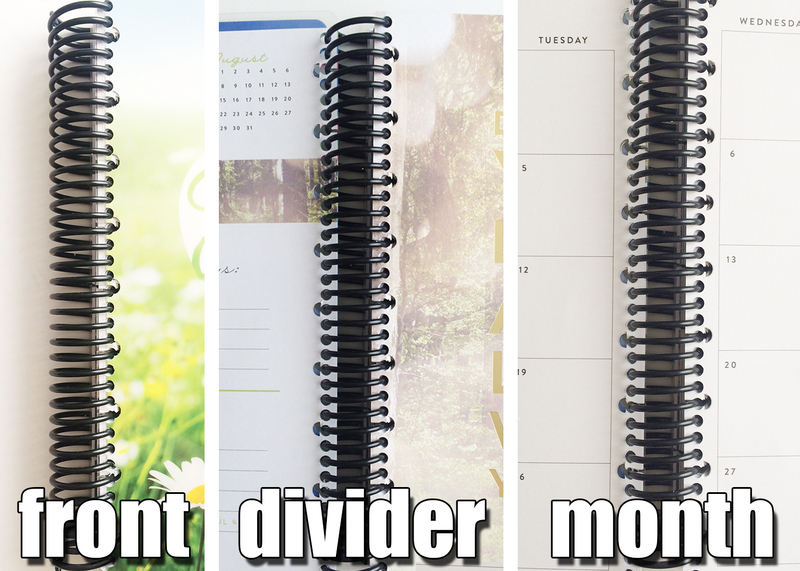 Can you put the Happy Planner inserts (folders and what not) in with the spiral binding?